Support your loved one with this great Personalized Pancreatic Awareness Shirt, whether it’s your Mother, Father, Sister, Brother, Friend or any loved one you know battling Pancreatic Cancer. With any Awareness Walk Event, you along with family and friends can show your support and help raise awareness together. Our Personalized Pancreatic Awareness Shirt is available on our premium 100% cotton long sleeve shirt, machine washable in youth sizes S-L and adult sizes S-2XL. Includes FREE Personalization! 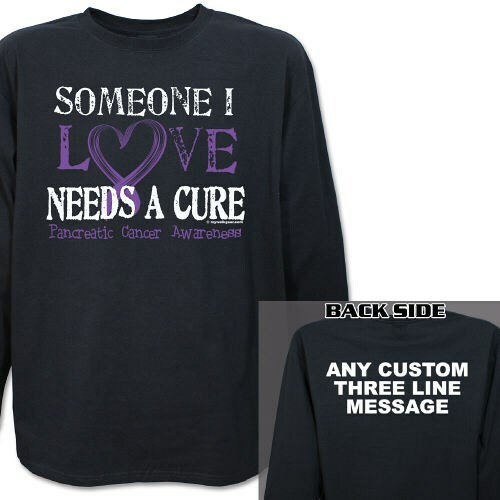 Personalized your Pancreatic Cancer Awareness Shirt with any three line custom message on the back. Excellent quality of shirts. Delivery time super quick. Everyone that received one had commented how wonderful they were.Thank-You for a great product! Quality of shirts are superior delivery time was very fast people have asked where I purchased them and have recommended site. Additional Info Our goal, at MyWalkGear.com, is to raise public awareness and understanding of pancreatic cancer along with many other cancers that people and their families suffer from. We are proud to help make a difference in the lives of those who are diagnosed with pancreatic cancer so we have created a selection of unique Pancreatic Cancer Awareness Apparel and Gifts for you and your loved ones to helps spread awareness. You will also love our Personalized Pancreatic Cancer Awareness T-shirt and our Pancreatic Awareness Tote Bag. You’ll feel great knowing a portion of our proceeds will help fund research so one day this disease will be something of the past.